Now yes Estrella Galicia is not produced in Andorra and so probably shouldn't be the Andorran candidate for this challenge. However Andorra's only brewery has closed down and so Andorra is now the only European country to not brew it's own beer. 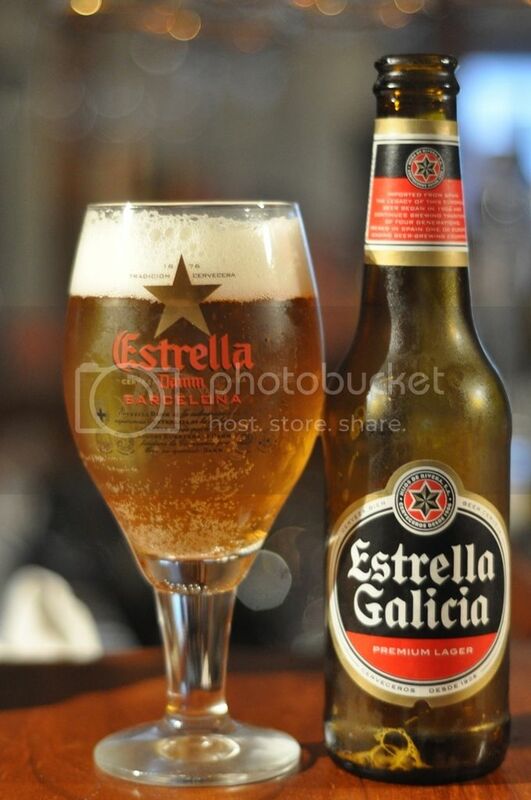 That is where Estrella Galicia comes in. For years the Galicia, which has a limited hold in it's native Spanish market place, has been the highest selling beer in Andorra. This beer has contributed to the collapse of Andorra's only brewery and so naturally is the beer that will represent Andorra in this challenge. I haven't had the Galicia before but have heard it's a pretty good beer. Let's see if the Andorran's made a good choice to dump their beer and (effectively) make this their national beer. Estrella Galicia pours a really nice colour for a lager, it's a deep gold colour with a heap of carbonation rising to a white airy head. The head has quite weak retention but it has some really good lacing. There is a strange ammount of sediment in this beer for a lager, but it seemed to all stay in the bottle whether by design or just luck. All in all it's a pretty good looking lager, that's a good start. The overall smell of this beer is slightly sweet. The malts give off a slightly honey-like aroma, while also having a strangely lemony smell that isn't related to the hops, which are a grassy variety. It has a slightly spicy twinge to it towards the end of the nose. It's very similar on the nose to Gambrinus, I'm pretty impressed with the nose. Galicia has a very different flavour than most European lagers. It's a sweeter lager that starts with a spicy hint to go with the honey flavoured malts. The beer is well balanced by some grassy hops, which have a good kick. The hops are actually quite bitter and make this beer really different and very drinkable. The moderately low carbonation definitely adds to the drinkability. It's a really nice lager which could make a fantastic session beer. Andorra's adopted national beer is one of the better drinker lagers I've had recently. It's incredibly easy to drink, and is of a significantly higher quality than the normal Estrella Damn. It's also one of the freshest lager's I've seen out here from Europe, the brew date was just 3 weeks before I bought this! All of these things together make it a good drop and definitely worth a go if you find it, from what I understand though there isn't alot of this brought out to Australia so if you find it buy up!